Hi, a week ago I installed DAZ Studio 4.5 and is perfect, but I have a couple of days trying to make my character cast shadows on the floor and it still fails. - Plane as ground with all displays on. .Shadow parameters: Deep Shadow Map, color = black, Intensity = 100%, Samples = 0, Softness = 0, Bias = 0. .Light parameters: Illumination on, color = white, Intensity = 100%. - And Genesis With All displays On. I may need to install a plugin? The first time I installed DAZ without Genesis, maybe I'm missing now install something else. Two things. First do you have a floor in your scene and second did you try Ray Traced Shadows? Ok, just 'double checked... I don't have that particular light but this looks odd "Samples = 0, Softness = 0, Bias = 0." All lights in DS has three Shadow settings, None (the default setting), Deep Shadow Map and Ray Traced Shadows. You need to turn the Shadows on in the Parameters of the light(s) you wish to cast a shadow. Hope this helps. EDIT: If you have other lights in the scene they could be Whiting out your shadows. Example: If lit from the side the shadow should be on that light might be killing the effect your looking for. As I said before, I put Deep Shadow Map and I tried now Ray Traced Shadows, but nothing. I edited my post. Also have you looked Through the Light like it was a camera? That helps line them up properly. You should have a shadow unless it is whited out or not aimed as you think. Do you have anything in the scene that could be blocking the light source? Something like a dome or high walls? 1. when I check the lights on Scene, only have 1 light. 2. I use a camera plus the light. 3. I only have a character and a floor plane, nothing can block the light. I still suggest you use the Drop down and LOOK through the light (they list under cameras) and see what it is pointing at. 1. It's a ShaderLight, it pointing at all the scene. It's at 45º. Anyway I see my character when I'm looking througt the light. 2. I check with others lights, and plane response at the ilumination, but dont cast any shadow. I don't use Shader lights, sorry. I know that the UBER area light is broken in DS4.5, maybe all shader lights are. Thats interesting... But how I can check this??? u know where I can download lights for DAZ 4.5? EDIT: 4 example, point lights doesn't work to me. Just Uber Area light is broken the other Uber lights work. 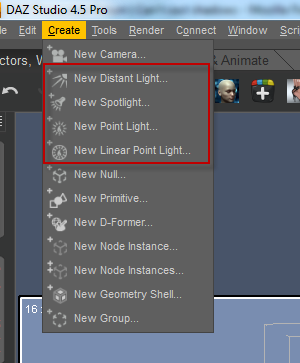 You have Point lights, Spot lights and Distant Lights built into DS just use Create to add one. As for other sets of lights the DS Store is full of light sets. Here is a link to all the Lighting and lighting related items here at DS. Make sure anything you get is for Daz Studio. It has Carrara and other sets in the list. EDIT: Point lights are for VERY CLOSE work only. Like a candle on a table ect.. they fade off very fast. 1. It's a ShaderLight, it pointing at all the scene. It's at 45º. Anyway I see my character when I'm looking througt the light.. Some require a 'companion' camera to 'work' properly...only basic functions of 'light' will work with the default camera. Caustics is one such function...it requires a light/camera pair. I do not Run Betas. I'll wait on 5. I have been using it with no problems at all, it is just a lot of bug fixes for the previous version. The IG lights work beautifully in it now, I wouldn't let the 'Bata' tag put you off. I'll check out the Fix list and think about it some. I had issues with RC2 so I'm a bit leary of Betas. I can't look at this DSDefault shader light at the moment to see what exactly it is. Doesn't sound light Area lighting to me. If it is an Area light plane then make sure the normal is pointing in the opposite direction to where the light is pointing. You can see this by choosing the Translation Tool and see which way the Green (I think) arrow is pointing. ty to all, i will try to reinstall and put this beta these days (dont have much time now) and respond later. No need to reinstall because of that issue...but the other bug fixes are probably worth it. Are you sure that your render setting isn't set to preview mode? Exactly how did you create this? Just using the built-in primitives? And how many segments did you make it in? I'm trying to remember a post from a few years ago on the old forums, if you make a large plane primitive that's all one polygon, you might have problems with textures, shadows, and a couple other things. Give the plane a few segments, 5 or 10 or so, and it'll work better. mjc1016 really?, I'll try with other lights :/ ... thats means I have to buy it? isn’t set to preview mode and the plane is small and have segments (primitive). Those lights are not the same as the shader lights that have the shadow problem. And yeah, I tested the default shader lights...still not working properly. Later I will watch the rest of lights you advise. I have nearly perfected using the omnifreaker uber volume shaders (dust, cloud, etc.) & a spotlight to get shadow beams/ light rays- good! I have installed DAZ 4.5 and can't get them to work- bad! I have tried loading an old scene from 4.0 that got the results I like and I've tried creating a completely new scene with all current lights, figures, uber sphere, etc. Any thoughts, tips, tricks on how to get them working again? There was a bug that affected Uberarea lights in DS 4.5.0.114, which was fixed in the Beta release 4.5.0.137. You can buy it from the store for $0.0 like the other versions.